The numerous fires still blazing across Sonoma, Napa, Mendocino and Lake counties have blackened more than 80,000 acres. There is almost no containment on any of the major fires. 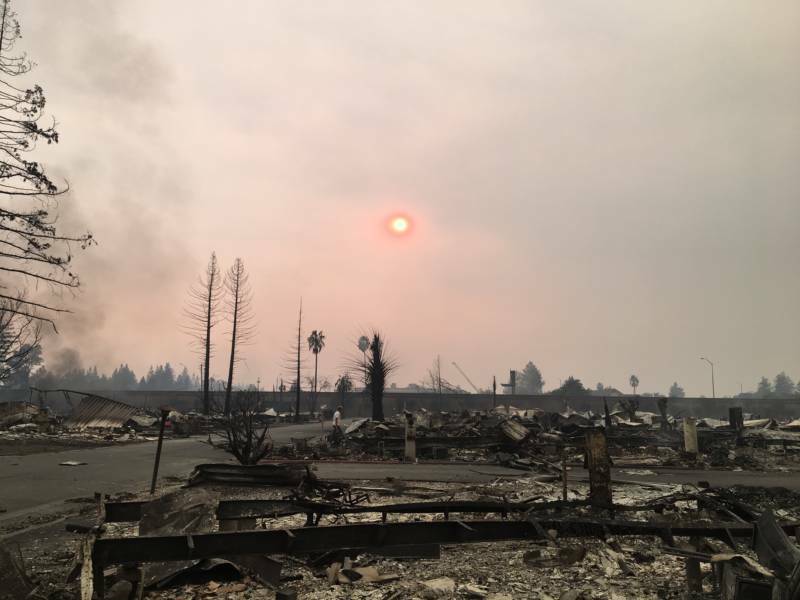 The Tubbs fire, which started in Calistoga and swept into Santa Rosa Sunday night, is the most destructive. Entire neighborhoods in the city were flattened. Flames engulfed homes in the neighborhood of Fountaingrove. Firefighters are still trying to save homes in several other parts of the city. After a night of devastation, an orange sun peaked eerily through a dark grey sky over a blackened lawn in front of the Hilton Hotel. The resort has been reduced to a charred heap. Across the street, smoke billows from Journey's End mobile home park. The community— now mostly in ashes—was home to seniors on fixed incomes. Journey's End mobile home park flattened by wildfires in Santa Rosa. Residents like Shirlene Gilman stroll slowly through debris. She points at a charred driveway. “This was my home," says Gillman, as she wipes tears from her eyes. Gilman inherited her yellow mobile home from her mother seven years ago. “I just feel so hopeless," she says. Across the street a community swimming pool is now a black puddle surrounded by torched deck furniture. 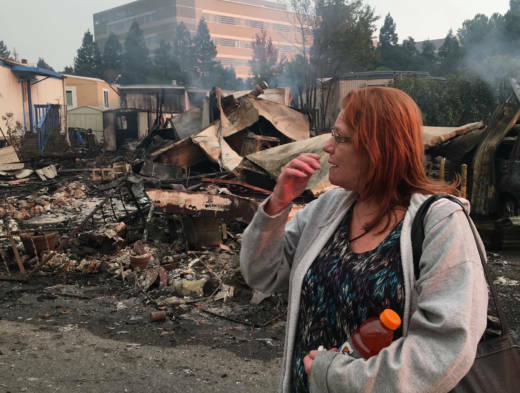 Gilman looks up and down her streets at the smoldering lots, recounting the names of neighbors who have lost their homes. Like many residents in Santa Rosa, Gilman received a knock on the door in the middle of the night ordering her to evacuate immediately. “Your brain just goes dead," says Gilman. "It’s like, what do I take? What do I take? I mean, I got a few clothes, but that’s about it." One block away, a neighbor of hers counts his blessings. Kenneth Simas stares kind of wild eyed at his brown mobile home. The only sign of damage on Simas's home is a layer of ashes on his front porch railing. A home less than 40 feet away is rubble. Fortunately, downtown Santa Rosa was not damaged by the flames, but all businesses are closed. A day after the fire started, there wasn’t a soul walking along the streets. But a shelter at the county fair grounds is packed with people nervously making calls, trying to find out more information about the homes they fled. Bonnie Shelley lost power in the middle of the night on Sunday. Shelley wasn’t even able to evacuate in her own car because her garage door wouldn’t open with the power out. So she hitched a ride with a friend to the emergency shelter at the fairgrounds in Santa Rosa. She’s still waiting to hear whether her home is still standing. Shelley's purse is the only other item she has with her. She doesn't even have the charger for her phone. Twenty-four hours after she evacuated her home, she was still depending on officials at the shelter to tell her what’s next.